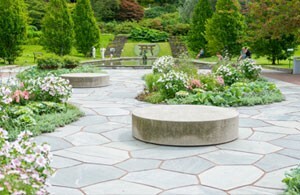 Stone veneers are an ideal choice for a cool and sophisticated backyard oasis. From retaining walls to decorative columns, striking accents for your water features or flower beds; it gives you flexibility of design and use. The versatility, beauty and durability of stone veneers have increased their popularity among architects, builders and property owners across Ontario. If you are looking for the chic and timeless look of natural stone but without the high price, stone veneer is a clear winner. A backyard is a multifunctional space where you can relax with family and entertain your guests. You want a space where you can enjoy the beauty of nature while creating a lasting impression with your decorating style. Stone veneer columns and retaining walls bring character and grandeur that few other materials can rival. You can have any colour and style you want, allowing you to recreate your favourite period look or your own signature design. Economical pricing fits into even a strict budget. To protect your investment, get stone veneer retaining walls and columns professionally installed. Reproduction of design and proper surface preparation need the work of experienced hands. Retaining walls have many challenges which only expert installers can solve. Important decisions such as whether you need supports or not can only be made by professionals. Type of cladding and finish also impact the final outcome and need a trained eye. Expert installers at Platinum Stone Veneer will advise you on how to optimize the look, performance and value of your stone veneer accents. How much value will stone veneer retaining walls and columns add to your home? Stone veneer walls and panels add luxury and appeal to your home. In fact, market research reveals that when properly installed, stone veneer exterior walls and backyard features can enhance property value by up to 20%. In addition to seamless installation, the professionals at Platinum Stone Veneer also provide handy tips that can help keep your walls and columns looking beautiful for years to come. To learn more about adding decorative columns and retaining walls,call Platinum Stone Veneer (416) 731-8600 or request an estimate online.